It is a great pleasure and an honour to extend you a warm invitation to attend the International Conference On Osteo Arthritis complications 2019, to be held October 24-25, 2019 Frankfurt, Germany. The Conference will feature a highly reciprocated, adrenalizing and multifaceted program including workshops, plenary sessions as well as oral abstract and poster sessions. Under the theme of ‘Therapeutic approaches for prevention of Osteo Complications,’ the meeting will address the entire patient pathway and look beyond the scientific topics alone. OsteoArthritis complications 2019 which is scheduled during October 24-25, 2019, at Frankfurt, Germany. The main theme of our conference is “Therapeutic approaches for prevention of Osteo Complications" which covers a wide range of critically important sessions. It’s a platform to bring all the Neurologists & orthopaedic surgeons together to share their experiences it’s the amalgam of scientific research as well as innovative ideas. The organizing committee is gearing up for an exciting and informative conference program including plenary lectures, symposia, workshops on a variety of topics, poster presentations and various programs for participants from all over the world. We invite you to join us at the OsteoArthritis complications 2019, where you will be sure to have a meaningful experience with researchers and industrial people across the world. All the members of Osteoarthritis Complications 2019 organizing committee look forward to meeting you in Germany. Conference Series LLC Ltd organizes 1000+ Global Events inclusive of 300+ International Conferences, 500+ Workshops and 200+ Symposiums every year across USA- Europe & Asia with support from 1000 more scientific societies and publishes 400+ Open access journals which contain over 30000 eminent personalities, reputed scientists as editorial board members. Join your peers around the world focused on learning about Osteo Arthritis complications 2019 and related advances, which is your single best opportunity to reach the largest assemblage of participants from the osteology, conduct demonstrations, distribute information, meet with current and potential professionals, make a splash with a new research work on osteology, and receive name recognition at this 2 days event. World-renowned speakers, the most recent research, advances, and the newest updates in are hallmarks of this Osteoarthritis Complication 2019 conference. Osteoarthritis (OA) is a type of joint disease that results from the breakdown of joint cartilage and underlying bone. The most common symptoms are joint pain and stiffness initially, symptoms may occur only following exercise, but over time they may become constant. Other symptoms may include joint swelling, decreased range of motion, and, when the back is affected, weakness or numbness of the arms and legs. The most commonly involved joints are those near the ends of the fingers, at the base of the thumb, neck, lower back, knee, and hips. Joints on one side of the body are often more affected than those on the other. Usually, the symptoms develop over some years. They can affect work and normal daily activities. Unlike other types of arthritis, only the joints are typically affected. Osteoarthritis is the most common form of arthritis, affecting about 237 million people (3.3% of the world population). Among those over 60 years old, about 10% of males and 18% of females are affected. It is the cause of about 2% of years lived with disability. In Australia, about 1.9 million people are affected, and in the United States, 30 to 53 million people are affected. It becomes more common in both sexes as people become older. Rheumatology, Orthopaedics & Sports Medicine, Osteoporosis Conferences, Osteoporosis Conferences, July 23-24, 2019 Osaka, Orthopaediac Congress, Japan; Osteoarthritis Conferences, Orthopaedics and Sports Medicine, April 25-26, 2019 Helsinki, Finland; Bone and arthritis conferences, Osteoporosis, Osteoarthritis, Orthopaediac Congress and Musculoskeletal Diseases, Osteoporosis Conferences, November 14 -15 ,2018 Tokyo, JAPAN; Osteoarthritis Conferences, Glasgow International Orthopaedic and Trauma Meeting 2019, Neuromuscular Conferences, May 17, 2019, Glasgow; Osteoarthritis Conferences, International Cartilage Repair Society Focus Meeting – One Step Cartilage Repair 2019 (ICRS 2019), June 6-8, 2019, Rome; Osteoarthritis Conferences, British Orthopaedic Association Instructional Course 2019 (BOA 2019), January 12, 2019, Manchester Orthopaedics Today Hawaii 2019 Orthopaediac Congress, Osteoporosis Conferences, January 13-17, 2019, Hawaii. It is the most broadly perceived clarification behind a broken bone among the old. Bones that generally break join the vertebrae in the spine, the bones of the lower arm, and the hip. Until a broken bone occurs there are normally no symptoms. Bones may weaken to such a degree, that a break may occur with minor weight or suddenly. Ceaseless torment and a decreased ability to finish a run of the mill activities may happen following a broken bone. The European Society for Clinical and Economic Aspects of Osteoporosis, Osteoarthritis and Musculoskeletal Diseases (ESCEO)| Osteoporosis Conferences | European Association For Osseo integration| Osteoarthritis Conferences | Osteology Foundation | Bone and arthritis conferences | | Bone and arthritis conferences | Musculoskeletal Association of Chartered Physiotherapists (MACP) | Neuromuscular Conferences | Committee of National Societies | Osteoarthritis Conferences | Osteoporosis Society of India | Osteoarthritis Conferences | Interdisciplinary Symposium on Osteoporosis | Osteoporosis Conferences | The International Osteoporosis Foundation (IOF) | Bone and arthritis conferences | The National Osteoporosis Society | Osteoarthritis Conferences | British Orthopaedic Association (BOA) | Osteoarthritis Conferences | Association for Chartered Physiotherapists with an interest in Orthopaedic Medicine and Injection Therapy (ACPOMIT) Neuromuscular Conferences | Osteoarthritis Conferences | Chartered Society of Physiotherapy | Osteoarthritis Conferences | European Society of Physical & Rehabilitation Medicine | Osteoporosis Conferences | Society of Diagnostic Medical Sonography | Bone and arthritis conferences Blue Leaf Physiotherapy | Osteoarthritis Conferences | National Multiple Sclerosis Society | Osteoporosis Conferences | European League Against Rheumatism (EULAR) | Osteoarthritis Conferences |Primary Care Rheumatology Society | Osteoporosis Conferences. Immature microorganisms therapeutic consideration for pathology may without a doubt cut back the defencelessness of breaks and expand lost mineral thickness by either expanding the numbers or re-establishing the work of occupant foundational microorganisms which will multiply and separate into bone-framing cells. Such pathology treatments are frequently administrated by the exogenous presentation of mesenchymal foundational microorganisms (MSCs), by and large, secured from bone marrow, fat, and funiculus blood tissues or through medicines with drug or minor particles that enrol endogenous undifferentiated cells to osteoporotic locales. Novel Physiotherapies, March 25-26, 2019 Rome, Orthopaediac Congress; Osteoarthritis Conferences, Spine and Spinal Disorders, April 25-26, 2019 Rome, Italy; Osteoporosis Conferences, Rheumatology Conferences, Osteoarthritis Conferences, American Medical Society for Sports Medicine (AMSSM) 28th Annual Meeting, April 12-14, 2019, Houston, Texas 77010, United States; Osteoarthritis Conferences, Trauma Symposium, Orthopaediac Congress, April 18-20, 2019, Atlanta, Georgia 30326, United States; Osteoarthritis Conferences, Musculoskeletal Ultrasound in Haemophilia (April), April 24-26, 2019, San Diego, Neuromuscular Conferences, California 92121, United States; Osteoarthritis Conferences, American Academy of Orthopaedic Surgeons (AAOS) Orthopaedic Board Preparation and Review Course. Neuromuscular Conferences, April 23-27, 2019, Chicago, Illinois 60654, United States; Osteoarthritis Conferences, A Comprehensive Tutorial in Musculoskeletal Imaging with Optional Mini-Fellowship Workshop (May), May 1-3, 2019, New York, New York 10017, United States, Osteoarthritis Conferences. Rheumatoid joint torment is a whole deal resistant framework issue that basically impacts joints. It routinely results in a warm, swollen, and painful joints. Distress and immovability every now and again escalate following rest. Most, by and large, the wrist and hands are incorporated, with comparative joints consistently included on the opposite sides of the body. The affliction may in like manner impact distinctive pieces of the body. This may result in a low red platelet count, disturbance around the lungs, and aggravation around the heart. Fever and low imperativeness may similarly be accessible. Normally, symptoms please gradually over weeks to months. Orthopaedic medical procedure additionally spelt orthopaedics, is the part of medical procedure worried about conditions including the musculoskeletal framework. Orthopaedic specialists utilize both careful and nonsurgical intends to treat musculoskeletal injury, spine illnesses, sports wounds, degenerative sicknesses, contaminations, tumours, and inborn issue. The European Society for Clinical and Economic Aspects of Osteoporosis, Osteoarthritis and Musculoskeletal Diseases (ESCEO)| Osteoporosis Conferences | European Association For Osseo integration| Osteoarthritis Conferences | Osteology Foundation | Bone and arthritis conferences | European Association of Social Anthropologists Association Européenne des Anthropologues Sociaux | Osteoarthritis Conferences | European Anthropological Association | Osteoporosis Conferences | British Association of Biological Anthropology and Osteoarchaeology (BABAO) | Bone and arthritis conferences | The Hungarian Society of Osteology and Osteoarthrology by István Takács | Osteoarthritis Conferences | Osteoporosis Conferences | The International Osteoporosis Foundation (IOF) | Bone and arthritis conferences | The National Osteoporosis Society | Osteoarthritis Conferences | British Orthopaedic Association (BOA) | Osteoarthritis Conferences | Association for Chartered Physiotherapists with an interest in Orthopaedic Medicine and Injection Therapy (ACPOMIT) Neuromuscular Conferences | Osteoarthritis Conferences | Chartered Society of Physiotherapy | Osteoarthritis Conferences | European Society of Physical & Rehabilitation Medicine | Osteoporosis Conferences | Society of Diagnostic Medical Sonography | Bone and arthritis conferences Blue Leaf Physiotherapy | Osteoarthritis Conferences | National Multiple Sclerosis Society | Osteoporosis Conferences | European League Against Rheumatism (EULAR) | Osteoarthritis Conferences |Primary Care Rheumatology Society | Osteoporosis Conferences. Ladies will, in general, be tormented by osteoarthritis more than men. Heredity builds the hazard: A hereditary deformity activating deficient ligament or a joint variation from the norm can prompt osteoarthritis. Other hazard factors are included: Obesity puts additional weight on knees and hips, which prompts ligament breakdown. Serious back damage or broken bone negatively affects the joints. The European Society for Clinical and Economic Aspects of Osteoporosis, Osteoarthritis and Musculoskeletal Diseases (ESCEO)| Osteoporosis Conferences | European Association For Osseo integration| Osteoarthritis Conferences | Osteology Foundation | Bone and arthritis conferences | European Association of Social Anthropologists Association Européenne des Anthropologues Sociaux | Osteoarthritis Conferences | European Anthropological Association | Arthritis Care| Neuromuscular Conferences | National Rheumatoid Arthritis Society | Bone and arthritis conferences | Sahlgrenska Academy Centre for Bone and Arthritis Research| Osteoarthritis Conferences | British Society for Rheumatology (BSR) | Bone and arthritis conferences | Musculoskeletal Association of Chartered Physiotherapists (MACP) | Neuromuscular Conferences | Committee of National Societies | Osteoarthritis Conferences | Osteoporosis Society of India | Osteoarthritis Conferences | Interdisciplinary Symposium on Osteoporosis | Osteoporosis Conferences | The International Osteoporosis Foundation (IOF) | Bone and arthritis conferences | The National Osteoporosis Society | Osteoarthritis Conferences | British Orthopaedic Association (BOA) | Osteoarthritis Conferences | Association for Chartered Physiotherapists with an interest in Orthopaedic Medicine and Injection Therapy (ACPOMIT) Neuromuscular Conferences | Osteoarthritis Conferences | Chartered Society of Physiotherapy | Osteoarthritis Conferences | Osteoporosis Conferences | European League Against Rheumatism (EULAR) | Osteoarthritis Conferences |Primary Care Rheumatology Society | Osteoporosis Conferences. Older age: Cartilage deteriorates with age. Gender: Women are more likely to develop osteoarthritis, though it isn’t understood why. Being overweight or obese: Extra weight puts more stress on your joints. Joint injury: Weak joints are more susceptible to osteoarthritis. Genetics: Some people inherit the tendency to develop osteoarthritis. Bone deformities: Being born with malformed bones or cartilage can increase your risk of OA. Certain jobs: Physically demanding jobs or jobs that require repetitive stress on joints can increase your chances of developing osteoarthritis. The European Society for Clinical and Economic Aspects of Osteoporosis, Osteoarthritis and Musculoskeletal Diseases (ESCEO)| Osteoporosis Conferences | European Association For Osseo integration| Osteoarthritis Conferences | Osteology Foundation | Bone and arthritis conferences | European Association of Social Anthropologists Association Européenne des Anthropologues Sociaux | Osteoarthritis Conferences | European Anthropological Association | Osteoporosis Conferences | British Association of Biological Anthropology and Osteoarchaeology (BABAO) | Bone and arthritis conferences | British Society for Rheumatology (BSR) | Bone and arthritis conferences | Musculoskeletal Association of Chartered Physiotherapists (MACP) | Neuromuscular Conferences | Committee of National Societies | Osteoarthritis Conferences | Osteoporosis Society of India | Osteoarthritis Conferences | Interdisciplinary Symposium on Osteoporosis | Osteoporosis Conferences | The International Osteoporosis Foundation (IOF) | Bone and arthritis conferences | The National Osteoporosis Society | Osteoarthritis Conferences | British Orthopaedic Association (BOA) | Osteoarthritis Conferences | Association for Chartered Physiotherapists with an interest in Orthopaedic Medicine and Injection Therapy (ACPOMIT) Neuromuscular Conferences | Osteoarthritis Conferences | Chartered Society of Physiotherapy | Osteoarthritis Conferences | European Society of Physical & Rehabilitation Medicine | Osteoporosis Conferences | Society of Diagnostic Medical Sonography | Bone and arthritis conferences Blue Leaf Physiotherapy | Osteoarthritis Conferences | National Multiple Sclerosis Society | Osteoporosis Conferences | European League Against Rheumatism (EULAR) | Osteoarthritis Conferences |Primary Care Rheumatology Society | Osteoporosis Conferences. Osteonecrosis is a bone disease. It results from the loss of blood supply to the bone. Without blood, the bone tissue dies. This causes the bone to collapse. It may also cause the joints that surround the bone to collapse. If you have osteonecrosis, you may have pain or be limited in your physical activity. Osteonecrosis can develop in any bone, most often in the Thighbone (femur), Upper arm bone (humour), Knees, Shoulders, Ankles. It is also called avascular necrosis/Aseptic necrosis/Ischemic necrosis. Avascular necrosis causes the following injury or Health problem. The European Society for Clinical and Economic Aspects of Osteoporosis, Osteoarthritis and Musculoskeletal Diseases (ESCEO)| Osteoporosis Conferences | European Association For Osseo integration| Osteoarthritis Conferences | Osteology Foundation | Bone and arthritis conferences | European Association of Social Anthropologists Association Européenne des Anthropologues Sociaux | Osteoarthritis Conferences | European Anthropological Association | Osteoporosis Conferences | British Association of Biological Anthropology and Osteoarchaeology (BABAO) | Bone and arthritis conferences | The Hungarian Society of Osteology and Osteoarthrology by István Takács | Osteoarthritis Conferences | Forensic Anthropology Society Of Europe | Osteoarthritis Conferences |Arthritis Foundation | Bone and arthritis conferences | Neuromuscular Conferences | The Arthritis Society | Osteoarthritis Conferences | Arthritis Care| Neuromuscular Conferences | National Rheumatoid Arthritis Society | Bone and arthritis conferences | Sahlgrenska Academy Centre for Bone and Arthritis Research| Osteoarthritis Conferences | | Osteoarthritis Conferences | Association for Chartered Physiotherapists with an interest in Orthopaedic Medicine and Injection Therapy (ACPOMIT) Neuromuscular Conferences | Osteoarthritis Conferences | Chartered Society of Physiotherapy | Osteoarthritis Conferences | European Society of Physical & Rehabilitation Medicine | Osteoporosis Conferences | Society of Diagnostic Medical Sonography | Bone and arthritis conferences Blue Leaf Physiotherapy | Osteoarthritis Conferences | National Multiple Sclerosis Society | Osteoporosis Conferences | European League Against Rheumatism (EULAR) | Osteoarthritis Conferences |Primary Care Rheumatology Society | Osteoporosis Conferences. The goals of treatment for avascular necrosis are to improve or ensure the function of the affected joint, stop the progression of bone damage, and reduce pain. The best treatment will depend on a number of factors, including, Your age, Stage of the disease, Location and amount of bone damage, Cause of avascular necrosis. The European Society for Clinical and Economic Aspects of Osteoporosis, Osteoarthritis and Musculoskeletal Diseases (ESCEO)| Osteoporosis Conferences | European Association For Osseo integration| Osteoarthritis Conferences | Osteology Foundation | Bone and arthritis conferences | European Association of Social Anthropologists Association Européenne des Anthropologues Sociaux | Osteoarthritis Conferences | European Anthropological Association | Osteoporosis Conferences | British Association of Biological Anthropology and Osteoarchaeology (BABAO) | Bone and arthritis conferences | Sahlgrenska Academy Centre for Bone and Arthritis Research| Osteoarthritis Conferences | British Society for Rheumatology (BSR) | Bone and arthritis conferences | Musculoskeletal Association of Chartered Physiotherapists (MACP) | Neuromuscular Conferences | Committee of National Societies | Osteoarthritis Conferences | Osteoporosis Society of India | Osteoarthritis Conferences | Interdisciplinary Symposium on Osteoporosis | Osteoporosis Conferences | The International Osteoporosis Foundation (IOF) | Bone and arthritis conferences | The National Osteoporosis Society | Osteoarthritis Conferences | British Orthopaedic Association (BOA) | Osteoarthritis Conferences | National Multiple Sclerosis Society | Osteoporosis Conferences | European League Against Rheumatism (EULAR) | Osteoarthritis Conferences |Primary Care Rheumatology Society | Osteoporosis Conferences. The Hungarian Society of Osteology and Osteoarthrology by István Takács | Osteoarthritis Conferences | Forensic Anthropology Society Of Europe | Osteoarthritis Conferences |Arthritis Foundation | Bone and arthritis conferences | Neuromuscular Conferences | The Arthritis Society | Osteoarthritis Conferences | Arthritis Care| Neuromuscular Conferences | National Rheumatoid Arthritis Society | Bone and arthritis conferences | Sahlgrenska Academy Centre for Bone and Arthritis Research| Osteoarthritis Conferences | British Society for Rheumatology (BSR) | Bone and arthritis conferences | Musculoskeletal Association of Chartered Physiotherapists (MACP) | Neuromuscular Conferences | Committee of National Societies | Osteoarthritis Conferences | Osteoporosis Society of India | Osteoarthritis Conferences | Interdisciplinary Symposium on Osteoporosis | Osteoporosis Conferences | The International Osteoporosis Foundation (IOF) | Bone and arthritis conferences | The National Osteoporosis Society | Osteoarthritis Conferences | British Orthopaedic Association (BOA) | Osteoarthritis Conferences | Association for Chartered Physiotherapists with an interest in Orthopaedic Medicine and Injection Therapy (ACPOMIT) Neuromuscular Conferences | Osteoarthritis Conferences | Chartered Society of Physiotherapy | Osteoarthritis Conferences | European Society of Physical & Rehabilitation Medicine | Osteoporosis Conferences | Society of Diagnostic Medical Sonography | Bone and arthritis conferences Blue Leaf Physiotherapy | Osteoarthritis Conferences | National Multiple Sclerosis Society | Osteoporosis Conferences | European League Against Rheumatism (EULAR) | Osteoarthritis Conferences |Primary Care Rheumatology Society | Osteoporosis Conferences. Modifiable risk factors that you can control or decrease your risk of getting some types of arthritis are Overweight and Obesity, Infection, Joint Injuries, Smoking. Osteoarthritis is classified as either primary or secondary. Primary osteoarthritis is the most common form. Although there is no known cause, numerous risk factors have been identified. Secondary osteoarthritis is caused by another disease that sets off the joint degeneration, such as an infection, severe injury, or a congenital deformity. The following are some of the most common risk factors to cause osteoarthritis are Age, Obesity, Injury, Gender, and Heredity. And the major health risk factors include the following. The European Society for Clinical and Economic Aspects of Osteoporosis, Osteoarthritis and Musculoskeletal Diseases (ESCEO)| Osteoporosis Conferences | European Association For Osseo integration| Osteoarthritis Conferences | Osteology Foundation | Bone and arthritis conferences | European Association of Social Anthropologists Association Européenne des Anthropologues Sociaux | Osteoarthritis Conferences | European Anthropological Association | Osteoporosis Conferences | British Association of Biological Anthropology and Osteoarchaeology (BABAO) | Bone and arthritis conferences | The Hungarian Society of Osteology and Osteoarthrology by István Takács | Osteoarthritis Conferences | Forensic Anthropology Society Of Europe | Osteoarthritis Conferences |Arthritis Foundation | Bone and arthritis conferences | Neuromuscular Conferences | The Arthritis Society | Osteoarthritis Conferences | Arthritis Care| Neuromuscular Conferences | National Rheumatoid Arthritis Society | Bone and arthritis conferences | Society of Diagnostic Medical Sonography | Bone and arthritis conferences Blue Leaf Physiotherapy | Osteoarthritis Conferences | National Multiple Sclerosis Society | Osteoporosis Conferences | European League Against Rheumatism (EULAR) | Osteoarthritis Conferences |Primary Care Rheumatology Society | Osteoporosis Conferences. Treatment aims to manage symptoms. It’s important to control pain while increasing mobility and joint functioning. Physical therapy can help increase mobility. Exercise is key to staying limber and maintaining your weight. But be careful not to overuse your joints and make symptoms worse. Take frequent breaks when exercising. There are many medications available to relieve OA pain, including acetaminophen (Tylenol) and nonsteroidal anti-inflammatory drugs. Cortisone injections can also be given to relieve pain, and lubrication injections can provide extra cushioning in your joints. The European Society for Clinical and Economic Aspects of Osteoporosis, Osteoarthritis and Musculoskeletal Diseases (ESCEO)| Osteoporosis Conferences | European Association For Osseo integration| Osteoarthritis Conferences | Osteology Foundation | Bone and arthritis conferences | European Association of Social Anthropologists Association Européenne des Anthropologues Sociaux | Osteoarthritis Conferences | European Anthropological Association | Osteoporosis Conferences | British Association of Biological Anthropology and Osteoarchaeology (BABAO) | Bone and arthritis conferences | The Hungarian Society of Osteology and Osteoarthrology by István Takács | Osteoarthritis Conferences | Forensic Anthropology Society Of Europe | Osteoarthritis Conferences |Arthritis Foundation | Bone and arthritis conferences | Neuromuscular Conferences | The Arthritis Society | Osteoarthritis Conferences | Arthritis Care| Neuromuscular Conferences | National Rheumatoid Arthritis Society | Bone and arthritis conferences | Sahlgrenska Academy Centre for Bone and Arthritis Research| Osteoarthritis Conferences | British Society for Rheumatology (BSR) | Bone and arthritis conferences | Musculoskeletal Association of Chartered Physiotherapists (MACP) | Neuromuscular Conferences | Committee of National Societies | Osteoarthritis Conferences | Osteoporosis Society of India | Osteoarthritis Conferences | Interdisciplinary Symposium on Osteoporosis | | Osteoarthritis Conferences | National Multiple Sclerosis Society | Osteoporosis Conferences | European League Against Rheumatism (EULAR) | Osteoarthritis Conferences |Primary Care Rheumatology Society | Osteoporosis Conferences. Rheumatoid arthritis and osteoarthritis both cause joint pain, stiffness, and limited range of motion, but the two diseases are distinct in their root cause and treatment. Rheumatoid arthritis is an autoimmune condition where a person’s own immune system attacks their joints, causing inflammation. Rheumatoid arthritis typically affects many joints simultaneously, especially in the hands, wrists, and feet, and is treated with medications to suppress the immune response. Osteoarthritis is not an autoimmune disease, and although the exact causes are not known, multiple risk factors have been identified. In a healthy joint, cartilage provides cushioning and a smooth joint surface for motion. In an osteoarthritic joint, as cartilage is irreversibly destroyed and bone abnormalities develop, movement becomes painful and more difficult. Arthroscopy (in like manner called arthroscopic or keyhole restorative strategy) is an insignificantly nosy medical procedure on a joint in which an examination and now and again treatment of mischief is performed using an arthroscopy, an endoscope that is implanted into the joint through somewhat cut. Arthroscopic methods can be performed in the midst of ACL entertainment. The ideal position over ordinary open medicinal technique is that the joint shouldn't be opened up totally. For knee arthroscopy only two little cuts are made, one for the arthroscope and one for the cautious instruments to be used in the knee pit. This reduces recovery time and may assemble the rate of advancement on account of less damage to the connective tissue. It has gotten universality as a result of verification of snappier recovery times with less scarring, in light of the more diminutive cuts. Water framework fluid (most routinely 'common' saline) is used to enlarge the joint and make a cautious space. The European Society for Clinical and Economic Aspects of Osteoporosis, Osteoarthritis and Musculoskeletal Diseases (ESCEO)| Osteoporosis Conferences | European Association For Osseo integration| Osteoarthritis Conferences | Osteology Foundation | Bone and arthritis conferences | European Association of Social Anthropologists Association Européenne des Anthropologues Sociaux | Osteoarthritis Conferences | European Anthropological Association | Osteoporosis Conferences | British Association of Biological Anthropology and Osteoarchaeology (BABAO) | Bone and arthritis conferences | The Hungarian Society of Osteology and Osteoarthrology by István Takács | Osteoarthritis Conferences | Forensic Anthropology Society Of Europe | Osteoarthritis Conferences |Arthritis Foundation | Bone and arthritis conferences | Neuromuscular Conferences | The Arthritis Society | Osteoarthritis Conferences | Osteoporosis Conferences | The International Osteoporosis Foundation (IOF) | Bone and arthritis conferences | The National Osteoporosis Society | Osteoarthritis Conferences | British Orthopaedic Association (BOA) | Osteoarthritis Conferences | Association for Chartered Physiotherapists with an interest in Orthopaedic Medicine and Injection Therapy (ACPOMIT) Neuromuscular Conferences | Osteoarthritis Conferences | Chartered Society of Physiotherapy | Osteoarthritis Conferences | European Society of Physical & Rehabilitation Medicine | Osteoporosis Conferences | Society of Diagnostic Medical Sonography | Bone and arthritis conferences Blue Leaf Physiotherapy | Osteoarthritis Conferences | National Multiple Sclerosis Society | Osteoporosis Conferences | European League Against Rheumatism (EULAR) | Osteoarthritis Conferences |Primary Care Rheumatology Society | Osteoporosis Conferences. A spinal crack additionally called a vertebral break or a crushed spirit, is a crack influencing the vertebrae of the spinal segment. Most sorts of spinal crack present a noteworthy danger of spinal string damage. After the prompt injury, there is a danger of spinal string damage (or compounding of an effectively harmed spine) if the break is shaky, that is, prone to change arrangement without interior or outside obsession. The European Society for Clinical and Economic Aspects of Osteoporosis, Osteoarthritis and Musculoskeletal Diseases (ESCEO)| Osteoporosis Conferences | European Association For Osseo integration| Osteoarthritis Conferences | Osteology Foundation | Bone and arthritis conferences | European Association of Social Anthropologists Association Européenne des Anthropologues Sociaux | Osteoarthritis Conferences | European Anthropological Association | Osteoporosis Conferences | Arthritis Care| Neuromuscular Conferences | National Rheumatoid Arthritis Society | Bone and arthritis conferences | Sahlgrenska Academy Centre for Bone and Arthritis Research| Osteoarthritis Conferences | British Society for Rheumatology (BSR) | Bone and arthritis conferences | Musculoskeletal Association of Chartered Physiotherapists (MACP) | Neuromuscular Conferences | Committee of National Societies | Osteoarthritis Conferences | Osteoporosis Society of India | Osteoarthritis Conferences | Interdisciplinary Symposium on Osteoporosis | Osteoporosis Conferences | The International Osteoporosis Foundation (IOF) | Bone and arthritis conferences | The National Osteoporosis Society | Osteoarthritis Conferences | British Orthopaedic Association (BOA) | Osteoarthritis Conferences | Association for Chartered Physiotherapists with an interest in Orthopaedic Medicine and Injection Therapy (ACPOMIT) Neuromuscular Conferences | Osteoarthritis Conferences | Chartered Society of Physiotherapy | Osteoarthritis Conferences | European Society of Physical & Rehabilitation Medicine | Osteoporosis Conferences | Society of Diagnostic Medical Sonography | Bone and arthritis conferences Blue Leaf Physiotherapy | Osteoarthritis Conferences | National Multiple Sclerosis Society | Osteoporosis Conferences | European League Against Rheumatism (EULAR) | Osteoarthritis Conferences |Primary Care Rheumatology Society | Osteoporosis Conferences. Neuromuscular sickness is a wide term that incorporates various diseases and illnesses that debilitate the working of the muscles, either direct, being pathologies of the stiff-necked muscle, or by suggestion, being pathologies of nerves or neuromuscular crossing points. Neuromuscular contaminations are those that impact the muscles and also their direct tactile framework control; issues with central anxious control can cause either spasticity or some dimension of loss of movement (from both lower and upper motor neuron issue), dependent upon the region and the possibility of the issue. The European Society for Clinical and Economic Aspects of Osteoporosis, Osteoarthritis and Musculoskeletal Diseases (ESCEO)| Osteoporosis Conferences | European Association For Osseo integration| Osteoarthritis Conferences | Osteology Foundation | Bone and arthritis conferences | European Association of Social Anthropologists Association Européenne des Anthropologues Sociaux | Osteoarthritis Conferences | European Anthropological Association | Osteoporosis Conferences | British Association of Biological Anthropology and Osteoarchaeology (BABAO) | Bone and arthritis conferences | Sahlgrenska Academy Centre for Bone and Arthritis Research| Osteoarthritis Conferences | British Society for Rheumatology (BSR) | Bone and arthritis conferences | Musculoskeletal Association of Chartered Physiotherapists (MACP) | Neuromuscular Conferences | Committee of National Societies | Osteoarthritis Conferences | Osteoporosis Society of India | Osteoarthritis Conferences | Interdisciplinary Symposium on Osteoporosis | Osteoporosis Conferences | The International Osteoporosis Foundation (IOF) | Bone and arthritis conferences | Neuromuscular Conferences | Osteoarthritis Conferences | Chartered Society of Physiotherapy | Osteoarthritis Conferences | European Society of Physical & Rehabilitation Medicine | Osteoporosis Conferences | Society of Diagnostic Medical Sonography | Bone and arthritis conferences Blue Leaf Physiotherapy | Osteoarthritis Conferences | National Multiple Sclerosis Society | Osteoporosis Conferences | European League Against Rheumatism (EULAR) | Osteoarthritis Conferences |Primary Care Rheumatology Society | Osteoporosis Conferences. Osteoarthritis is the most prevalent joint disease costing approximately 1-2.5% of the gross domestic product of developed countries. Greater than 75% of patients experience pain on a daily basis. Current standard therapies for pain relief, such as non-steroidal anti-inflammatory drugs and opioids are limited by their modest efficacy and long-term safety. In the last decade, the nerve growth factor (NGF) has emerged as a promising target for osteoarthritis pain. The incidence of osteoarthritis is likely to increase. One of the greatest challenges with treating osteoarthritis and subsequent joint damage is repairing the damaged tissue, especially as cartilage tissue is difficult to regenerate. Bone and arthritis conferences | The Hungarian Society of Osteology and Osteoarthrology by István Takács | Osteoarthritis Conferences | Forensic Anthropology Society Of Europe | Osteoarthritis Conferences |Arthritis Foundation | Bone and arthritis conferences | Neuromuscular Conferences | The Arthritis Society | Osteoarthritis Conferences | Arthritis Care| Neuromuscular Conferences | National Rheumatoid Arthritis Society | Bone and arthritis conferences | Sahlgrenska Academy Centre for Bone and Arthritis Research| Osteoarthritis Conferences | British Society for Rheumatology (BSR) | Bone and arthritis conferences | Musculoskeletal Association of Chartered Physiotherapists (MACP) | Neuromuscular Conferences | Committee of National Societies | Osteoarthritis Conferences | Osteoporosis Society of India | Osteoarthritis Conferences | Interdisciplinary Symposium on Osteoporosis | Osteoporosis Conferences | The International Osteoporosis Foundation (IOF) | Bone and arthritis conferences | The National Osteoporosis Society | Osteoarthritis Conferences | British Orthopaedic Association (BOA) | Osteoarthritis Conferences | Association for Chartered Physiotherapists with an interest in Orthopaedic Medicine and Injection Therapy (ACPOMIT) Neuromuscular Conferences | Osteoarthritis Conferences | Chartered Society of Physiotherapy | Osteoarthritis Conferences | European Society of Physical & Rehabilitation Medicine | Osteoporosis Conferences | Society of Diagnostic Medical Sonography | Bone and arthritis conferences Blue Leaf Physiotherapy | Osteoarthritis Conferences | National Multiple Sclerosis Society | Osteoporosis Conferences | European League Against Rheumatism (EULAR) | Osteoarthritis Conferences |Primary Care Rheumatology Society | Osteoporosis Conferences. Forensic Anthropology Society Of Europe | Osteoarthritis Conferences |Arthritis Foundation | Bone and arthritis conferences | Neuromuscular Conferences | The Arthritis Society | Osteoarthritis Conferences | Arthritis Care| Neuromuscular Conferences | National Rheumatoid Arthritis Society | Bone and arthritis conferences | Sahlgrenska Academy Centre for Bone and Arthritis Research| Osteoarthritis Conferences | British Society for Rheumatology (BSR) | Bone and arthritis conferences | Musculoskeletal Association of Chartered Physiotherapists (MACP) | Neuromuscular Conferences | Committee of National Societies | Osteoarthritis Conferences | Osteoporosis Society of India | Osteoarthritis Conferences | Interdisciplinary Symposium on Osteoporosis | Osteoporosis Conferences | The International Osteoporosis Foundation (IOF) | Bone and arthritis conferences | The National Osteoporosis Society | Osteoarthritis Conferences | British Orthopaedic Association (BOA) | Osteoarthritis Conferences | Association for Chartered Physiotherapists with an interest in Orthopaedic Medicine and Injection Therapy (ACPOMIT) Neuromuscular Conferences | Osteoarthritis Conferences | Chartered Society of Physiotherapy | Osteoarthritis Conferences | European Society of Physical & Rehabilitation Medicine | Osteoporosis Conferences | Society of Diagnostic Medical Sonography | Bone and arthritis conferences Blue Leaf Physiotherapy | Osteoarthritis Conferences | National Multiple Sclerosis Society | Osteoporosis Conferences | European League Against Rheumatism (EULAR) | Osteoarthritis Conferences |Primary Care Rheumatology Society | Osteoporosis Conferences. v All types of Osteology and Neurology-related research are eligible for submission. v Abstract should address scientific questions, detail clinical observations, or contain primary scientific data. v Abstracts of clinically-related subjects should be combined into a single abstract. Submission of multiple abstracts on a single study may result in the rejection of one or more abstracts. Osteoarthritis is the most widely recognized type of joint pain which causes torment, swelling, and diminished movement in the joints. More often than not, osteoarthritis influenced joints are comprehensive of hands, knees, hips and spine. Osteoarthritis breaks the ligament of the joints which is a tricky tissue covering the finishes of bones in a joint. The geriatric populace and over-weighted people are at higher dangers of osteoarthritis. Developing geriatric populace, the rising pervasiveness of the osteoarthritis and expanding per capita social insurance use will drive the market development amid the estimated time frame, from 2017-2023. In 2015, as per the National Institutes of Health, the American geriatric populace is relied upon to almost twofold from 48 million of every 2015 to 88 million by 2050. In addition, as indicated by the Centres for Disease Control and Prevention around 78 million (26%) U.S. grown-ups matured 18 years or more are assessed to have specialist analysed joint pain, by 2020. Be that as it may, low per capita salary in the creating nations and reactions of the treatment methods will limit the market development amid the estimated time frame. 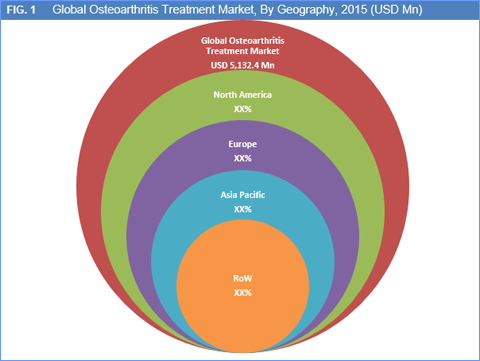 The worldwide osteoarthritis showcase is relied upon to develop at an inexact CAGR of 6.8% amid the conjecture time frame. The worldwide osteoarthritis showcase is fragmented based on sort, conclusion, treatment, and end clients. Based on sort, the market is portioned into hip osteoarthritis, wrist osteoarthritis, spinal osteoarthritis, and others. Based on the conclusion, the market is fragmented into imaging, joint liquid investigation, and others. The imaging portion is subdivided into X-beams, attractive reverberation imaging (MRI), and others. Based on treatment, the market is portioned into prescription, medical procedure, treatment, and others. The prescription portioned is subdivided into analgesics and non-steroidal calming medications, and others. The analgesics sub-portion, by prescription, is additionally divided into acetaminophen, duloxetine, and others. The non-steroidal mitigating drugs subsection, by medicine, is additionally portioned into headache medicine, ibuprofen, naproxen sodium and naproxen, and others. Based on end clients, the market is portioned into emergency clinics and facilities, therapeutic establishments, examine association, and others. America commands the worldwide osteoarthritis advertise inferable from a very much created social insurance division and gigantic patient populace for osteoarthritis. Aside from this, changing way of life and expanding human services use have helped the development of the market in America. In 2015, as per the Centres for Disease Control and Prevention, in the U.S. the all-out medicinal services consumption represented 17.8% of the absolute total national output (GDP), which represented USD 3.2 trillion. Europe is the second biggest osteoarthritis advertise, which is trailed by the Asia Pacific. Accessibility of assets for research, immense patient populace, expanding human services uses, all around created social insurance area and government support for research and improvement are anticipated to drive the market development amid the estimated period. Locally, Europe is isolated into Western Europe and Eastern Europe. Western Europe holds the real offer of the local market, which is significantly contributed by Germany, the U.K., and France. Nonetheless, Eastern Europe is the quickest developing area due to the colossal open doors in the undiscovered market. The Asia Pacific is the quickest developing district in worldwide the market because of the nearness of a gigantic patient populace, constantly creating economies like India and China, and nearness of colossal open door in the market. As indicated by Indian Brand Equity Foundation in 2017, the Indian social insurance division is one of the quickest developing businesses and is relied upon to progress at a CAGR of 22.87% amid the survey time frame to reach USD 280 billion by 2020. Also, good government strategies and expanding medicinal services consumptions powers the market development inside the area. Then again, the Middle East and Africa holds minimal offer in the worldwide osteoarthritis advertise because of quality of poor economy, particularly, in African locale. The dominant part of the market of this locale is held by the Middle East because of the very much created social insurance area and immense human services consumption by the nearness of economies like Kuwait, Saudi Arabia, Dubai and Qatar. Osteoarthritis is the most well-known type of joint pain which causes torment, swelling, and decreased movement in the joints. Normally, osteoarthritis influenced joints are comprehensive of hands, knees, hips and spine. Osteoarthritis breaks the ligament of the joints which is an elusive tissue covering the finishes of bones in a joint. The geriatric populace and over-weighted people are at higher dangers of osteoarthritis. Developing geriatric populace, rising commonness of the osteoarthritis and expanding per capita social insurance consumption will drive the market development amid the estimated time frame, from 2017-2023. In 2015, as per the National Institutes of Health, the American geriatric populace is relied upon to almost twofold from 48 million out of 2015 to 88 million by 2050. Additionally, as per the Centres for Disease Control and Prevention around 78 million (26%), U.S. grown-ups matured 18 years or more are evaluated to have specialist analyzed joint pain, by 2020. Notwithstanding, low per capita salary in the creating nations and reactions of the treatment techniques will control the market development amid the figure time frame. The worldwide osteoarthritis showcase is relied upon to develop at a surmised CAGR of 6.8% amid the figure time frame.